Trip day 1: We left Lake View Lodge at 6:15am to reach the MoAfrika Lodge. After a quick run through of what was going to happen that day as well as a tour of our truck "Rumphi" (all the Acacia trucks were named after African rivers), we packed our stuff into the spacious lockers at the back on the truck (just inside the door), there was only 9 of us and 24 lockers, which luckly afforded us to have a couple of lockers each (Alicia and I had 3 between us). By 7am we were ready to go and the first few hours were spent driving whilst we got a more in-depth briefing on what we'll be doing for the next 7 days as well as a brief history of South Africa from Justin. We stopped at a service station to use the bathroom and Alicia bought some pies. After another hour or so driving we stopped at a shopping complex where we could do some food and drink shopping. We bought snacks for the trip as well as some lunch. I wanted a slice of pizza and Alicia wanted a salad, so we reached a strange compromise of me having pizza and Alicia having pizza and a salad. Plus, we shared a massive custard slice (it was Valentine's day after all). I bought some booze (30X220ml Amstel cans) from the nearby bottle shop called "Tops" and Alicia picked up a box of Rose wine as a sort of high end Goon. When we got back to the truck we discovered we were the only 2 people to actually buy alcohol! Especially surprising as it transpired that I was by some way the oldest on the trip at the ripe old age of 26, the youngest being 18 and most of the Australians had been sold Acacia as an 18-30's style adventure trip. We travelled another 45 minutes to our campsite for the evening where it was nice to see our tents were already set up for us, so all we had to do was unpack for the night. Unpacking took longer than it should as everyone was trying to get stuff out of their lockers at the same time. After everyone had set up their stuff for the evening we had a tour around the campsite called Hazyview, followed by a welcome drink of local coconut rum and mango fizz. Everyone sat around the bar area drinking, but it was really too hot to stay put for too long (36.5 C), so after we finished our drink we changed into swimming gear and headed down "sometimes hippo-infested (but only at night)" lake. The lake was a lovely murky brown colour with a zip line going into it. Various people took turns to zip line into the water whilst another person rowed a small boat out into the middle of the lake to collect them. It was all pretty fun (although one of the Australian girls called Zoe, repeated made racist comments when one of the African lads who worked there was demonstrating the zip line and helping to row the boat. It was pretty uncomfortable and after the 3rd time of pointing out "black people can't swim" and pointing and laughing at the lad, we left to go and find the more secluded rock pool / mini waterfall). Alicia and I sat in the rock pool amongst picture-esque surroundings with a small waterfall trickling down the rocks. It was really very pleasant. A few other member of our group start to join us in relaxing in the sun for heading out for food and the evenings entertainment. For dinner we gathered around a circular area for a traditional meal of "pap" which was a sort of plain oatmeal, with sides of peanut cabbage and meat all eaten without cutlery. It was good fun and surprisingly tasty. Afterwards we were sat around a campfire where we had a traditional dance troupe/choir preform for us in traditional African clothing. They showed us variously regional dances and song (e.g. Zulu), they even got myself and another German girl, Anina up to join them. They just seemed to be going crazy with their dancing, wildly kicking the dusty ground, flailing their arms and even kicking themselves in the head. I didn't have the flexibility to kick myself in the head, but I could do some crazy dancing about. I had a great time. Afterwards, we talked to the troupe leader about some of the dancing and he had travelled all over the world performing for private functions and in competitions, he even invited himself to stay at our house in the UK when he's over next. He doesn't know where we live though (luckily). After that we headed to bed for our first night camping in Africa. Having camped numerous times before I wasn't expecting to sleep that well, but the thick foam camping mats where really comfortable and we both slept really well. Trip Day 2: We all got a wake up call early at 4:45am, no one really minded through as we were already onto what was set to be one of our tour highlights, Kruger National Park. For had a quick breakfast of cereal and a banana and was picked up at 5:40am in a typical 4X4 safari vehicle by our guide called "Derek". 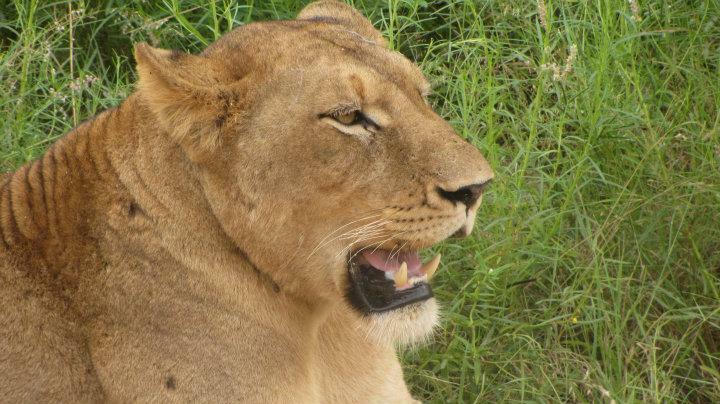 The animals are most active early morning or in the evening, so we were luck that Kruger was only 20 minutes away. Once in the park Alicia almost immediately spotted a Kudu (a large grey antelope, with 3 white stripes on it's back and big corkscrew antlers - each full turn represents 2 years in age). Only a few minutes later we almost drove straight passed a huge bull elephant (Big Five #1) until I shouted "wait! ", I can understand how our group missed it, but how did the guide?? Zoe said "how did you see that!?" and I had to resist the urge to say something sarcy like "what? That huge chuffing elephant only feet away from the truck?....no idea". Kruger is huge and isn't quite like I'd imagined a safari, most of the roads were nicely tarmacked and instead of baron red savanna, it was green and lush and filled with tall grass and large trees. None of us were expecting it and it did make spotting animals more difficult, although next we spotted a giraffe, which is one of the easier animals to spot despite the long grass. As we drove around we spotted the back of a buffalo (Big Five #2) followed by many, many impala sighting. We stumbled across a white Rhino (Big Five #3) sat on a path sleeping in the increasing heat. It being dozy allowed us to drive very close to it and it was massive! It woke up and quickly stood up at one point which resulted in us reversing quite quickly away. The next sighting was one of a few sighting of the ferocious leopard tortoise slowly wandering round (one of the Small Five). We spotted a couple more single bull elephants before a long baron spell. We drove for sometime without really seeing anything, but then a call came through Derek's walky talky and we were off for a "surprise". Alicia and I spotted more elephants and giraffe but we didn't stop. We did halt briefly to view a herd of rhino, one of which had a very small baby running around and another adult had the classic "bird on it's back". After a little more driving we discovered the surprise was supposed to be lions, but they'd gone before we got there. We drove up and down the street looking for the lions but only spotted a smaller type of kudu. After driving up and down some more, we turned around and slowly made our way back. We saw the kudu again when Derek suddenly stopped the car. There was a leopard (Big Five #4) stalking the nearby kudu, I caught a glimpse of it as it slowly crouched down into the long grass. We were all very excited to be seeing an actual hunt, trying to communicate to each other but all as quietly as possible so to not startle the kudu who switched between eating grass and watching us. It was tense, no one could see the leopard or had any indication of where it was, it didn't even disturb the grass. We were suddenly faced with a difficult decision however as up the road in the distance we could see a lion walking down the track (Big Five #5). We quickly and quietly discussed the options of either staying and seeing the hunt to the end or going to get up close to a lion, before the kudu then wandered just out of sight behind a bush. This made our decision for us and we raced over to the lioness, who was sat on the side of the track, allowing us to get close (although wild, they didn't pay any attention to us). After a brief photo shoot we raced back to see the leopard but there was nothing to be seen. After a few minutes we heard the kudu's grunting to signal there was danger and saw the kudu that was being stalked appear from behind the bush. Did we miss it or could we just not see it? The lion had retreated back into the shade also and was surrounded by other trucks now making it very difficult to see. Derek needed to pee anything (the excitement too much for him?) so we started to head to a nearby base, stopping quickly when we spied water buffalo and a family of baboons (one with a baby under 2 months old attached to it's stomach and one huge male). We reached the base at around 10:20am and had a short stop for half an hour to use the loos and look round the shop. After leaving we started the next segment of our safari with a bang, after yet more impala lining the roads, we came across a pack of the extremely rare wild dogs! Wild dogs are the rarest animal in Kruger park with only around 120 in the entire park of just under 20,000 square km. The pack we saw had around 12 in. We all got a great view as they came out of the bush and stood next to the road, but in his excitement Derek reversed too far and mess up my photos by parking the back row of seats in front of a large bush. By the time he moved, they had retreated to lay in the long grass under a tree, still visible, but not good for a photo. As we drove off we unfortunately started another long period without any sightings of big animals what-so-ever, this lasted nearly 2 hours. Most people slept in the midday sun, but I stayed up to admire the amply, colourful birdlife that surrounded us. Eventually I spotted a zebra in the distance, then an elephant in the far distance (it was just nice to see something by this point). Just before spotting for some food there were some zebras close to the road, 2 huddled close together facing opposite directions, they apparently do this for protection, then finally some white rhino, just to end in a minor flurry of animals before lunch. We stopped off at one of the designated spotting stations for lunch. These spots were areas within the park that had been fenced off and had a security gate to pass through to enter meaning that it was safe to get out, walk around and eat food. We had a lunch of cold sausages and potato salad. Derek hadn't joined us since he was a bit of a grump because the group couldn't tell if a rhino was black or white for a mile or so away (you can apparently tell by the position of it's head). There was a couple of interesting birds around the campsite including a common but very pretty blue iridescent starling and a yellow-billed hornbill (Zazu off of Lion King). After lunch we headed out for a couple of hours to drive around although because of the increasing heat and the time of day he wasn't too confident we'd see much else. So the aim of this afternoon was really just to look at the different flora that was growing around Kruger. We spotted at the side of the road a few times so Derek could lean out and pick some plants. We brushed out teeth with a twig that you strip the bark from, saw "African loo paper" as well as plants used as antiseptic. Towards the end of the day we saw a massive herd of elephants in the distance, complete with small babies. Seeing the herd was nice as up until now we'd only seen singular bull elephants. We also spotted one more giraffe. As we were leaving the park there was just enough time to spot a few more birds including the starling and hornbill again but also the colourful bee-eater bird, an eagle and a kingfisher among others. We exited the park and drove back to camp returning at 3:30pm. We took the opportunity to relax in the shady campsite with Alicia and I sipping a metal mug full of rose wine until there was space for us to use the (much needed) shower. It was very good. Trip Day 3: It was another early start for today, waking up around 4am to have breakfast (cereals, fruit and bread) and dust down our tents and get ready to go. After the excitement of yesterday today was pretty much just a driving day. A full 9 hours of travel. We stopped a couple of times at a supermarket for provisions and for toilet breaks. We were heading for the Botswanan boarder and after Justin had briefed us about what to expect he fell asleep on one of the many spare seats. Zoe took a picture of him with her phone and promptly uploaded it to Facebook with the title "our guide asleep on the job". Continued in "Africa - Rumphi Trip - Botswana"